Truckee Meadows Water Authority (TMWA) was created by a cooperative agreement between Reno, Sparks, and Washoe County and began operation in June 2001. TMWA’s primary directive is to provide reliable, high-quality water service to customers in an efficient, cost-effective manner. TMWA’s Water Resource Plan describes how the utility will meet the potable-water-supply needs of current and future customers in the Truckee Meadows given various factors such as population change, economic cycles and climate conditions. The plan details both what TMWA expects and how it is planning to address various scenarios related to water supply and water demand. The end goal is to provide a look into the future and describe how the utility will deliver a reliable, high-quality, water supply in a cost effective manner to its customers. The complete “2016-2035 Water Resource Plan” (2035WRP) can be viewed at: tmwa.com/wrp. The 2035WRP is built on prior plans and is the third edition since TMWA’s 2001 inception. Prior versions provide historical context of how events have shaped the often-controversial topic of water resource management in the region. This plan analyzes trends in climatic, demographic, economic, regulatory and legal influences that affect TWMA’s ability to deliver potable water. Understanding the Water Resource Plan can be difficult without some knowledge of the tumultuous legal and operational history of the Truckee River system. To gain a more complete understanding of TMWA and regional water resource management since the late 1800’s, readers are encouraged to review the 2025WRP and the 2030WRP (also available at tmwa.com/wrp). As a municipal provider of water service, TMWA takes a long-term planning perspective to ensure its available water resources are reliable and sustainable. Events, such as recession or population growth, that affect water demand and delivery can take years to unfold and their impact is not always immediately clear. TMWA’s water resource planning anticipates and provides for changes over a 20-year period. This offers a reasonable timeframe in which to implement effective solutions. As economic and political changes can potentially affect demand for water, seasonal fluctuations in Truckee River flows may also impact supplies. A prime example of how our community adapts to these changes is the Truckee River Operating Agreement (TROA). TROA is the result of decades of careful water resource planning and addresses concerns over future water supply. It replaces rigid and inflexible Truckee River water management, which was dictated by decades-old court decrees and designed to serve the needs of a small, rural community. TROA provides flexible operating criteria, allowing TMWA to adapt to variability of climatic, hydrologic and economic conditions, while leveraging available storage space in federal reservoirs. By granting TMWA permission to store additional water in upstream reservoirs, providing drought protection to meet foreseeable municipal needs, the community has further enhanced its sustainable water supplies to meet demand for generations to come. TMWA is continually evaluating and adapting its supply strategies to ensure it can meet the needs of its customers through prolonged wet and dry periods. This is why TMWA updates its water resource plan every five years. If conditions significantly change within the five-year cycle, TMWA may update the plan sooner. Based on supply and demand projections, TMWA’s Water Resource Plan describes strategies for water resource management in view of regulatory constraints to the use of TMWA’s water resources. In addition to the Water Resource Plan, TMWA prepares a 20-year Water Facility Plan and regularly updates funding plans to ensure continued success in achieving its mission. Both plans are operational in nature, in that they identify facilities needed to generate high-quality, potable water supplies for current and future customers in a cost-effective manner. The Water Resource and Facility Plans form the basis for TMWA’s Funding Plan. The objective is to develop workable strategies that are cost effective and protect the financial integrity of TMWA. 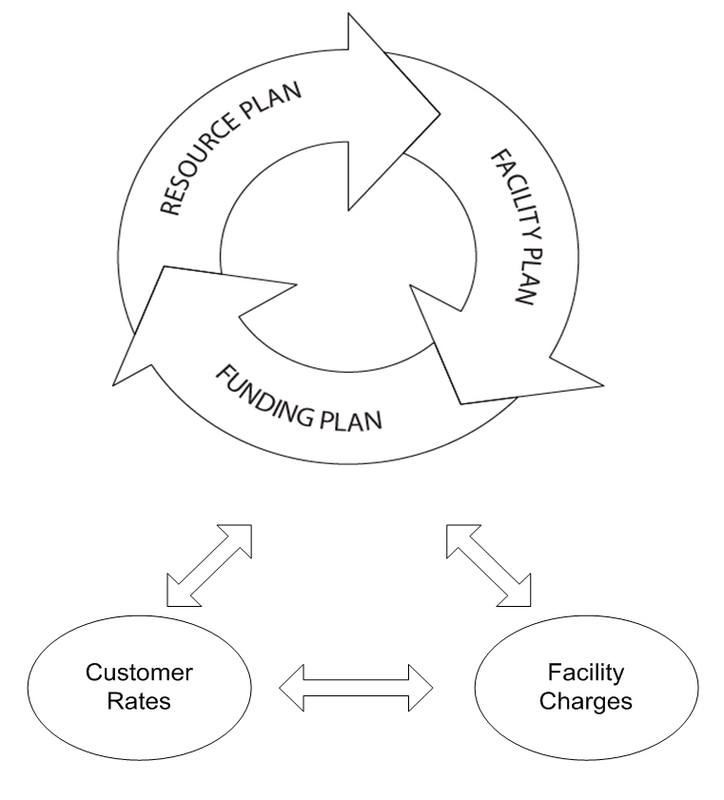 A visual representation of the cyclical nature of TMWA’s dynamic, integrated planning approach is shown below. The cycle of planning, monitoring, analyzing, and updating is a continuous, dynamic process necessary to respond to changing economic and environmental factors that affect the current and future water supply for the greater Truckee Meadows. The complete “2016-2035 Water Resource Plan” (2035WRP) can be viewed at: tmwa.com/wrp.